An excellent post by Owen Barder shows why migration is such a good idea. Migrants earn money and lift themselves and their families out of poverty. Their own countries benefit from the increased foreign exchange earnings — and the money goes straight to the poor. Migration drives technology transfer and knowledge sharing. Studying abroad can also improve leadership and governance. I landed on Owen’s post after seeing Laura Freschi’s entry on the subject and reading the World Bank paper on which it’s based, which evaluates the impact of New Zealand’s seasonal employment scheme on the Pacific island states. Having worked for several years in the Pacific, my own experience in Vanuatu and elsewhere is that the scheme is almost unambiguously a Good Thing. The Pacific Island countries are amongst the highest recipients of aid per capita in the world, and the marginal benefits of aid diminish at a certain point. Aid donors often act according to political interests and tend to fund large projects in the capital. But remittances from abroad are a fresh source of income that reach areas of the economy that aid doesn’t. For once, ordinary ni-Vanuatu people from villages in the outer islands are able to earn their own money and do what they want with it. I’m currently in Tuvalu, where among the few options for economic development are tourism and labour mobility. The country is too small to grow much or have any industry. Unfortunately only 48 workers went to New Zealand for the 2008/9 season and 99 the year before. Tuvalu hasn’t benefited nearly as much as Vanuatu, which sends about 1500 workers a year. Government should be pushing hard to expand its involvement in the scheme, and to extend it to Australia. I, like Owen, was incensed at some of the comments after his post. Have these people never been north of Watford? No, Britain is not ‘full up’. Scotland has a stagnating population which threatens to fall below 5 million. Scotland is crying out for skilled and unskilled labour, and luckily the political leadership is enlightened enough not to indulge in the populist insularity of British Prime Minister David Cameron. As Owen points out, Britain is only the 51st most populated country. Most countries have plenty of room for more workers. It’s not economics that leads to the closing of borders; it’s unthinking social exclusivity. The comments on Freschi’s blog entry quickly turned to the supposed subversives waiting to wreak strife among the communities of the developed world. But I doubt that a horde of intolerants is banging on Europe’s doors. Most migrants just want to get a job, keep their heads down and work hard. 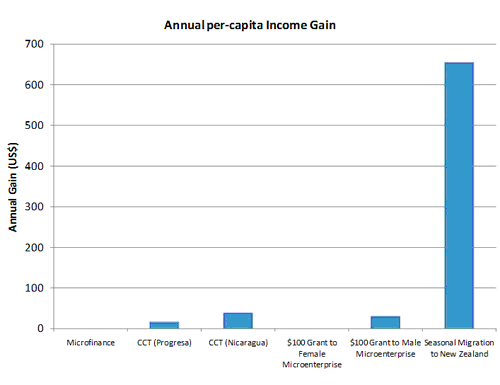 And as the graph in the World Bank blog shows, the seasonal migration scheme to New Zealand produced by far the highest annual per capita income gain of all the development interventions shown. Freschi is right: the gains are so massive that they easily outweigh any minor social objections. Knee-jerk anti-immigration sentiment shouldn’t be allowed to deprive poor people of these benefits — which sometimes save lives.